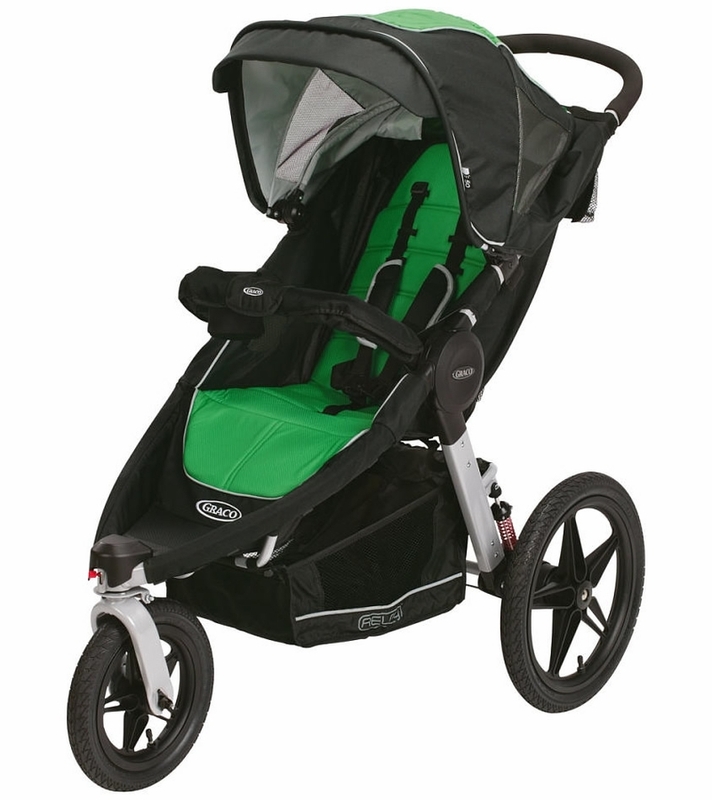 Graco's Relay Click Connect Jogging Stroller is the ultimate performance jogger � the only one with all accessories included, allowing you to include your child in your active lifestyle. Designed for avid joggers, it features air-filled rubber tires, a locking front-swivel wheel with tracking, premium suspension and a lightweight frame. Reflective, tech-fabric helps keep you visible in low light and the UV50 canopy gives your child sun protection. This stroller is compatible with all Graco Click Connect infant car seats to create a custom travel system. It's just what moms - who need to go the extra mile � need! Great stroller. Ours was produced in March of 2014. The front wheel is plastic and broke on 5/29/17! Not bad for being so old and used so much. Great stroller for the price. I had this for about 1 year now. It is great for jogging and long trips around the suburbs. It does not do so well in the city because it is bulky. It is somewhat heavy but sturdy. The 1 fold click is a great feature when I load it into the car. It takes over most of the back space in a Honda CRV and about half the space in a Honda Pilot (with the 3rd row down). We use it almost everyday and I have not had a flat tire yet. We received this stroller as a shower gift. It moves very smoothly but is extremely heavy and cumbersome, it doesn't fit in my small car. If I had to choose again, I would not have selected this stroller, I would have chosen a smaller Graco model. If you are an avid jogger, this is a great choice for you. I bought this stroller two years ago and have loved everything about it! My little one loves how fast we can go when we run I love how durable it is and how you can go off roading if you want too and living in hawaii you tend to do that with some hikes here! We received this stroller at our baby shower as a gift. We do a lot of outdoor activities and love how protective this is. Wasn't to sure I'd be a fan of the size. However I'm loving it non the less. The bike tires definitely help when having to go thru rough terrain. Would recommend this to anyone that is outdoors most of the time because it does stand up against t all. I've had this stroller for about 10 months. In that time, all 3 of the tires have had to be replaced as they will no longer hold air. With all 3 tires properly inflated, it has a smooth ride when walking or jogging. I wish the seat could be adjusted to be less inclined so my daughter can see out more easily. It's incredibly bulky to store. The canopy is large but would be better if it were detachable for better sun blockage. The mesh beverage storage leaves something to be desired as it is hard to remove and replace a drink while running. 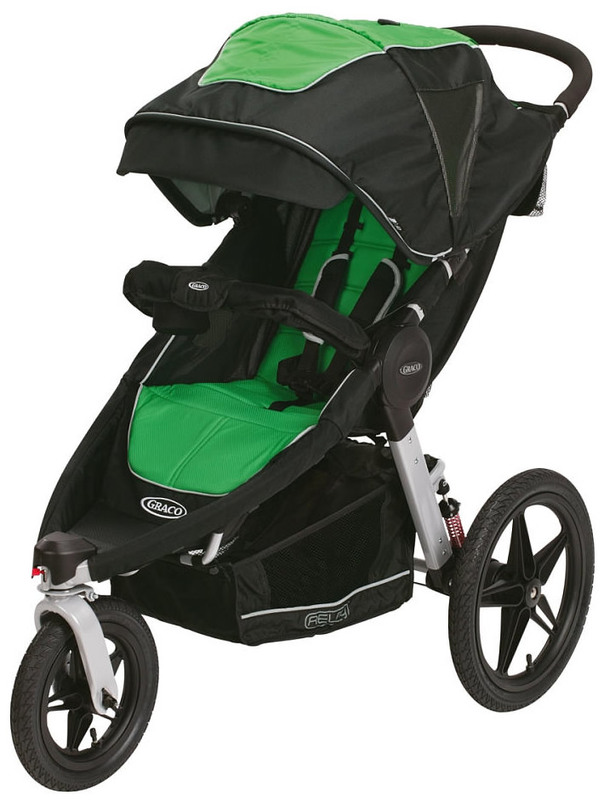 Overall, it's a good jogging stroller for the price. I have had my Stroller for a little over a year now and have been using it for about 9 months. I am extremely unsatisfied with the quality of the fabric the product is made with. The stroller seat is already ripping away from the frame and i have an extremely small baby. She only weighs 20 lbs and is in the seat for a max of 40 minutes a day. I bought this to use with the Graco Classic Connect car seat which to my disappointment is not compatible with Click Connect models. I really wanted a jogging stroller and it was already assembled so I held onto it until my little one was big enough to ride in it without his car seat. I like that the tires are large and that bumps in the sidewalk barely even felt. It also has a pretty decent sized storage area. The things I hate most about this stroller are the weight and difficulty of unfolding it. It is very awkward compared to the non-jogging Graco stroller that we have. I also have issues with steering. When the front wheel is locked, you cannot turn at all and it occasionally becomes unlocked. When it is unlocked, it seems to have a mind of its own and always veers towards one side or another. I have messed with it many times and cannot figure out why its so hard to steer. I give it 3 stars though, because my little one always seems extremely comfortable in it. I just received this jogger yesterday and I love it! My little one is 9 months old and our other stroller never provided enough shade. I love that the canopy on this jogger protects her from the sun. The tires provide a smooth ride and it's easy to steer. We will be getting a lot of use out of this for years to come! I love this stroller! It is perfect for taking my daughter to the park and on walking trails. We purchased this 3 years ago and it's been great. It can roll over any terrain smoothly. Even going up and down curbs. Very smooth, very well made, unbreakable. My baby loves this stroller. It's great in the yard or on a sidewalk, bumps are no big deal! I love that I can adjust the wheel tracking, and that it's so easy to fold and stow. Truly worth every penny. Love that it works with infant seat! This stroller drives like a dream. Like most joggers, it takes up a lot of space though. It is great for outdoor use and places like the zoo. I don't like the way it folds/unfolds as the handle touches the ground when folded. Since it supports the stroller in this position, it seems like it will cause wear and tear on it. I bought this from someone in excellent used condition and love everything about it except the fold isn't very compact. Takes up a lot of cargo room. I've used this on several surfaces and it has done amazing!! Whether it's at the zoo or going for a hike, I love this stroller!! Used for 9 months now with a baby that was 10 months at purchase. He stopped using it when awake as we use carrier but amazing to have him sleeping and give us complete freedom of movement in the evenings! great for rough terrains, we have been constantly travelling with it. I got this a year ago and haven't used it for a few months because the front wheel wobbles terribly when I try to jog. I am very upset because I got this specifically for that reason. Do not get it if you like to run. It's not worth it. I initially loved this stroller. It was comparable to the BOB jogging stroller that I had been eyeballing in the store and all over the web. When I finally purchased this stroller it was everything I could want in a jogger. It was super simple to put together out of the box. It turns like a charm. I love the one brake mechanism because I'm not having to wrangling with two seperate brakes on wheels like most jogging strollers. I like that I had the option of having the wheel on the front locked or in swivel mode. This is a great smooth and comfortable stroller for my one year old daughter. However, besides all of the great things this stroller has to offer my particular stroller has a huge downfall. This downfall is the one hand fold up. My one handed folding mechanism has been stubborn since day one. Sometimes it will unlock so I can unfold the stroller and sometimes it refuses. Sometimes it will pull up to fold the stroller and sometimes it won't. Today while at the outlets with my family the one handed folding strap under the seat decided it would just completely stop functioning. So I was stuck with a stroller that would not fold down at all. It is a good thing I have a big truck with a bed because if I did not I would have had to leave the stroller at the outlets. I was beyond upset that my barely 2 month old Graco Relay Stroller was already broken. I have not used this stroller more than 6 times. In that short amount of time and use the stroller is broken. It looks brand new but does not function in the way it is advertised to do so. I'm hoping that it is covered under warranty and that Graco will stand behind their product. This is the 2nd Graco stroller that my family owns for our one year old daughter. The first is a Graco Fastaction Fold Click Connect Travel System in Nyssa. That stroller is holding up great and we keep it at my moms home so she can take our daughter to the park while baby sitting. Also I can't say enough about the car seat because it saved my daughters life when we were side swiped when she was only 3 months old. Grace is a great brand but I can't recommend this stroller unless they fix the one handed fold and unfold mechanism. This stroller is awesome! I love the look of it and how great it strolls! I have gone on my many walks with this stroller and have yet to be disappointed. I literally just received the stroller, but my little one and I took it for s soon this evening and we both loved it! Easy maneuverability and a place for all my stuff. Also, comfortable for my passenger, who was asleep at the end of our run. We just purchased this stroller in anticipation of a visit from our first grandson who lives out-of-state, so we haven't actually used the stroller yet. It folds up and opens up very easily. It seems to be vastly better than the "umbrella stroller" that ours daughters rode around in!! Easy to put together. It took us less than 10 minutes. I have not used the stroller yet, since the baby isn't due until March. However, I have put the stroller together and pushed it around. The unit went together easily and seems like it is going to be a smooth ride for the baby. My 10 year old has tested it out with her doll and she loves it! 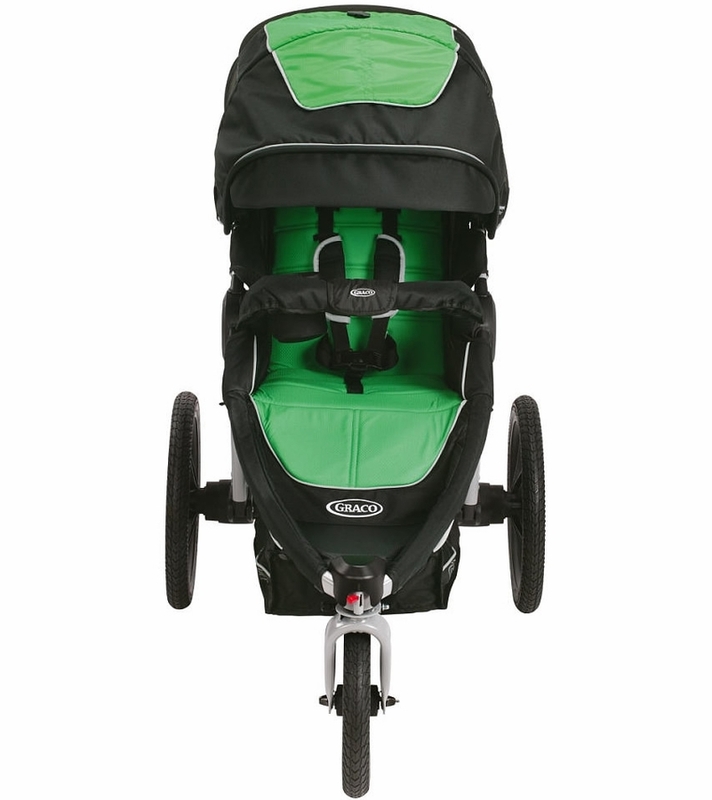 I had looked at the FastAction Fold Jogger in the store and it has some benefits that this does not (larger basket under neath seat; better snack tray for the little one, and a better parent tray); however, this model seems to have better "all terrain" wheels and shocks that will allow for a smoother ride. I believe that this is going to be a great stroller. All Graco products exceed my expectations. And I'm always happy with my purchases. I ended up purchasing one anD I love it it's so pretty and love that it can swivel. Expensive strollers DO NOT BUY!!!!!!!!!!!! Not worth it!! I rather pay a little more for a better performing stroller. This stroller is super bulky and not practical. The stroller when folded up takes up most of my trunk space. When shopping I barely can get the wheels to turn through the isles. 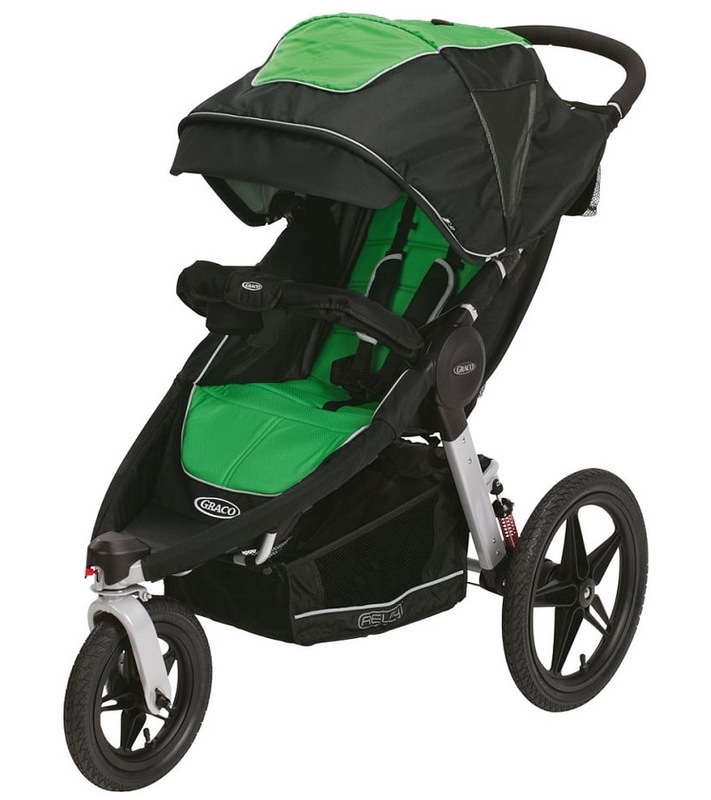 I also use this stroller for jogging but be careful the shade will not cove a toddlers legs and they will get sunburn. This is a waste of money! Bought this stroller about a month ago and the front wheel came off. Terrible stroller. I have a 4 Month old and was anxious to go running but nervous about her safety in the stroller. When I finally gave it a try, she was snug as a bug and the run was great. Easy to manuever and push while running. You should make sure that you have a leash or something attached to the handles in case you fall since the stroller is so mobile that it can get away from you. Works real well with the Click and Connect Car Seat!! Def recommend this for the running mommy. So my little girl has never had the chance to ride in a stroller because of money Issues. Graco is just awsome im over here crying tears of joy. They just gave me this for Free! I always thought big companys were selfish but they proved me wrong. Thanks GRACO. You are wonderful, god bless you. I bought one 6 months ago. And I love it. It goes with me everywhere. Love the color. This stroller mobility is so easy to use.